Home sales in the SW Florida real estate market set an all-time record in April 2009 with 1,468 single family home sales, eclipsing the mark set in March of 1,464. Sales are literally off the charts as affordability is in the market. In fact, median home sale prices in the Fort Myers Cape Coral area fell by 3.39% last month down to $85,500, down from $88,500 in March. For a comparison of monthly home sales in SW Florida from 2005-2009 see the latest Fort Myers Cape Coral home sales chart. Median prices in SW Florida are down 57% from last year, down from $200,300 to $85,500 Median single family home sale prices have fallen every month this year except for February when they went up 2.74% See our SW Florida Real Estate Month Over Month Prices chart. To illustrate just where median home sales prices are today Vs. where they have been every year since 2005, visit our SW Florida Real Estate Sale Prices 2005-2009 chart. Condo sales in the Fort Myers and Cape Coral area were up 7% over last year, and probably would have been much higher if FNMA hadn’t changed financing rules making it increasingly difficult to finance most condominium associations throughout SW Florida. It used to be we worried about whether or not the buyer was qualified for a mortgage, and this past year we learned it was much more difficult to get a condo association approved than it is to get the buyer approved. Banks have over-reacted and will cause further problems in the condo market going forward, which may actually increase delinquencies as existing owners will not be able to refinance or sell to anyone other than a cash buyer. Condo median prices in Cape Coral and Fort Myers fell 33% from $195,500 last year to $131,800 this year. The Fort Myers News Press interviewed Brett Ellis of the Ellis Team at RE/MAX Realty Group in Fort Myers about Lee County’s all-time sales record. 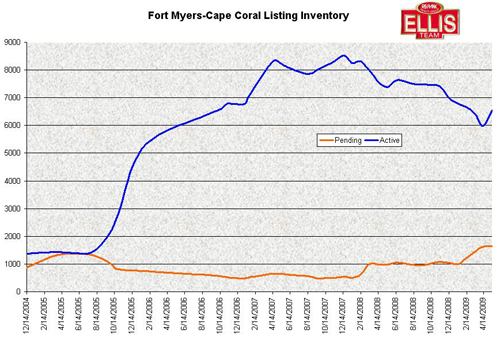 Below is a graph of inventory levels in just Fort Myers and Cape Coral since 2004. The blue line is the active inventory listed in MLS and the orange line is the pending sales listed in MLS. As you can see, back in 2005 there were as many buyers in the marketplace as there were sellers trying to sell. These figures do not include all of Lee County Florida, but rather just the Fort Myers and Cape Coral areas of Lee County. At the end of the graph you’ll see a slight increase, but this is due to us switching MLS systems and including slightly more data. We’ll watch this trendline from here on out but we can say inventory has been decreasing for months and foreclosures have not been keeping pace with the record sales we’re experiencing here in SW Florida. Bank foreclosure agents we’ve spoken with all are noticing a decrease in bank foreclosure inventory. The Ellis Team has sold much of it’s bank owned foreclosure inventory and have just about 6 left. We expect more in the future, but as of right now first time home buyers, second home buyers, and investors have scooped up all but 6 we just received. The 6 bank foreclosures have bank financing available at 4% interest with a 7 year balloon and 5% down for a primary buyer, and 6% interest and 20% down for an investor, or buyers can obtain their own financing. 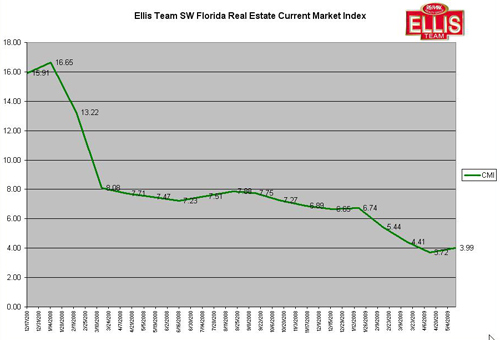 The Ellis Team May 2009 SW Florida Real Estate Current Market Index shows relative stability. We switched the way we compile the data for this report, and it looks like the index held steady at 3.99, up slightly from 3.72 the month prior. All signs point to big sales ini April once they are released. We are tracking over 1,400 single family home sales in April, which far exceeds sales from last year. In the coming days we will be releasing a Fort Myers-Cape Coral inventory chart which will show available inventory in just those areas, as well as pending sales activity. Lee County overall single family inventory stands at 12,579 which is up slightly from last months number of 12,356. Again, we switched data compilation sources and we now feel we’ll pick up a few extra listings by making the change, so it’s possible inventory didn’t really increase at all. First time home buyers hoping to take advantage of the $8,000 tax credit are competing with investors trying to scoop up bank foreclosure bargains. Pending sales currently are running high, and might even be higher if we weren’t running out of foreclosure inventory. The lack of foreclosure inventory may lead to reduced sales going forward if foreclosures do not pick back up again soon. Some think the banks will be taking possession of more foreclosures soon as they work through the process, but less are being filed each month. Is the SW Florida Housing Market Rebounding? That is the question WINK News asked. WINK interviewed Brett Ellis and wanted to know how bank foreclosures were affecting the local SW FLorida real estate market. See WINK News report Local Housing Rebound? Bank foreclosures are drying up, and first time home buyers are competing with investors for these good deals. Inventory levels have continued to fall as home sales break all-time records. Because builders are not building right now, it will be interesting to see what happens if we don’t have a continued pipeline of affordable bank foreclosures to sustain buyers insatiable appetite for housing in SW Florida. Brett also did a newspaper article with the Fort Myers News Press about how Lee County’s Meltdown Turns Golden for home buyers. Agents are amazed at how far prices have dropped, and perhaps they have over corrected. Listing inventory has fallen sharply in hard hit areas like Cape Coral, and Lehigh Acres is seeing a resurgence in home buying activity as buyers jump from Cape Coral in search of affordable houing in SW Florida. Single family home sales in Fort Myers and Cape Coral MSA were up 192% in March 2009 over March 2008. The Fort Myers and Cape Coral MSA encompasses Lee County Florida. Home sales totalled 1,464 this year as compared to 501 last year. Statewide sales were up 30% and median prices were down 30% from last year. Fort Myers and Cape Coral is definitley leading the state in transaction increases. Miami was next in line with a 101% increase in sales transactions. For a complete chart of transactions by city and median prices, check out Florida Sales Report March 2009 Existing Single Family Homes. We’ve included a chart that shows home sales from 2005-2009 in SW Florida. As you can see from our SW Florida Real Estate Sale Prices 2005-2009, sales prices are nothing like what they were in years past. Prices declined 9.23% last month alone largely due to increased numbers of foreclosures selling in the lower price ranges, as you can see from our Month Over Month Sales Prices Chart. Condo prices in Fort Myers and Cape Coral were down 36% from last year to a median price of $126,200, down from $196,400 last year. Sales were up 53% this year as buyers reacted to the tremendous bargains in the market. Many buyers have sensed the market has or is close to bottom and they better act soon. See Condo Florida Sales Report. Buyers have also responded to the $8,000 tax credit that essentially gives first time home buyers, or anyone who has not owned a home that was their primary residence in the last 3 years, a tax credit of 10% of sale price up to a limit of $8,000 Essentially the government is making the down payment for buyers, and buyers who put less than 10% down pocket the difference. There are some income requirements. See First-Time Home Buyer Tax Credit-What You Need to Know or watch our video explaining the First Time Home Buyer Tax Credit. NBC Nightly News recently did a report “Is Now the Time To Buy a Home” which can be fouond directly on our webpage. there are some particularly good deal deals in Fort Myers real estate right now as pointed out in the NBC Report.